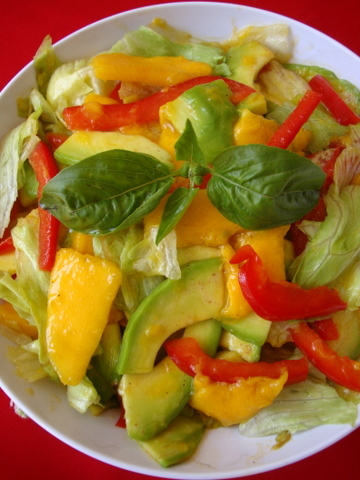 Prepared a simple, colorful and flavorful salad using avocado and ripe mango for lunch today. Refreshing with combination of textures – both avocado and mango being creamy, and lettuce providing a bit of crunch, the salad has a mingling of savory and sweet flavors. Perfect hot weather salad that is simply outstanding. One of the best refreshing salads I have had in recent times. In a bowl, whisk 1 crushed garlic, a tbsp of lemon juice, a tbsp of olive oil, salt and crushed pepper to taste and a tbsp of honey. 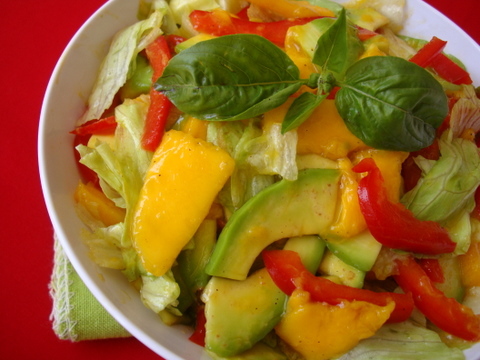 Add 1 peeled and sliced ripe mango, 1 peeled and sliced avocado, 1 sliced red bell pepper and washed and torn lettuce. Toss well till combined with dressing. Serve chilled garnished with basil or coriander leaves. Healthy and delicious salad.. looks very tempting.. pass me a plate sailu.. nice clicks!!! Perfect combo!!! Healthy fat from avacodo balancing the sugar in mangoes….very colourful and the pictures are simply superb!!! Looks great. where do you get Avocados in India..esp Vizag? I was telling my mother about avocado recipes and how much we started loving them here but could never get them taste it. A nice guacamole would be the best dip for corn chips or papad or even as a spread for a toasted bread slice! Nice use of mangoes and avocados here. A chef friend sourced them for me, Josh. Never available locally. 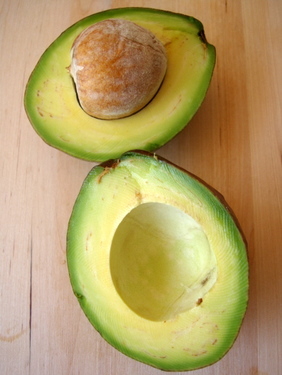 Avocado is grown in Kodaikanal region in Tamil Nadu. Its available in Bangalore and Chennai markets on a regular basis. gr8 combo of mango and avocado..
Lovely combination Sailu and beautiful pic. Salad look so colourful and great!! This is mouth watering! 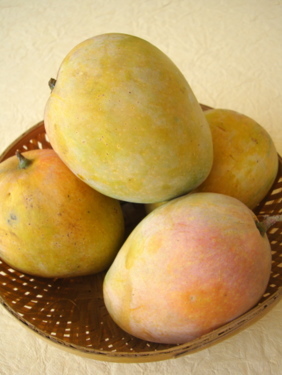 You are lucky to have homegrown mangoes, here in US we get mangoes that are neither sweet nor juicy. I am extremely curious. Where in Vizag or Vijayawada would I find Avocados? I didn’t think I could find them in India, and apparently I am wrong.